Compact tin coatings are appreciated for their protective value against weathering, water, solutions, and various substances, among which food. The reason why tin can be used for the latter purpose lies in the fact that it assumes an anodic behaviour compared to iron. In the atmosphere and with many solutions, on the other hand, tin behaves in a nobler way. Hence, the need for the coatings not to be porous, in order to avoid that tin accelerates, rather than delay, the corrosion. Tin plating is sometimes preferred for the white colour of tin, which remains unchanged also in contact with moisture and various gases (which does not happen, for example, with silver, which blackens). Tin melts at 230°, i.e. at a very low temperature. This property has led to the extensive use of thermal tin plating, electrolytic tin plating from molten salts, and further heat treatment after tin electroplating from aqueous solutions. 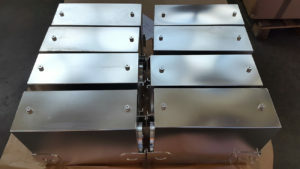 There are three tin plating systems: thermal tin plating, which currently holds the record, especially for large plates and semi-finished products, galvanic tin plating, which is becoming increasingly popular, especially since it allows better control of the thickness of the various objects coatings, including plates, and, finally, electroless tin plating, that has a certain importance for special purposes. Coatings can also be made of two layers obtained afterwards, thermally and electrolytically. Galvanic tin coatings prove to be very flexible and usually have variable porosity. Compared to those obtained thermally, they are mostly opaque, unless special brightening agents are used in the baths. Tin deposits can be obtained from alkaline baths and acidic baths. While in alkaline baths tin is a stannic compound (tetravalent tin), in acidic baths it is a stannous compound (bivalent tin). It follows that in alkaline baths the electrochemical equivalent is half of that possessed by acidic baths: therefore, for quick processing, the latter are more convenient. In addition, acidic baths have a higher current efficiency: in fact, faced with a current efficiency of 90-96% of acidic baths, alkaline ones only show a current efficiency of 60-80% and this, mainly because of the strong contemporary development of hydrogen during electrolysis. Tin is quite resistant against corrosion and oxidation; coatings offer particular protection against moderate stress, such as those taking place inside containers. 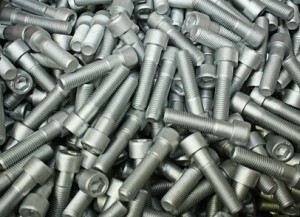 The average thicknesses on ferrous materials for common uses are: 50 μm for protection against corrosion and attack of food containers: 20 μm for protection against weak atmospheric corrosion; 5 μm for weldability; 8μm as substrate for painting; 5-10 μm for protection (reserve) against nitriding. For the purpose of corrosion resistance, in addition to thickness, the porosity index should be considered, that is, the ratio between the number of pores visible to the naked eye at normal reading distance, detected on the significant surface under test, and the area of said surface expressed in square dm. The maximum values are: 10 for a thickness of 10 μm, 2 for a thickness of 25 μm, and 0.2 for a thickness of 50 μm. Electrolytic tin finds many uses for its harmlessness towards food, for its own characteristics and those of its inorganic compounds, as well as for its weldability. It is applied at minimum thicknesses because it is expensive. Electroplating by galvanic baths creates more compact and pore-free deposits, possibly glossy without further thermal or mechanical treatments. The tanks to be used for alkaline baths, as well as the relevant installations for heating, stirring, etc., may be made of iron; iron tanks plated with wired glass sheets, or coated with polyvinyl chloride can also be used. For acidic baths stoneware tanks, or iron tanks coated with hard rubber or polyvinyl chloride should be used. It is imperative to avoid that baths become impure with various metals, otherwise the resulting deposits will be defective. As for the possible heating of acidic baths, lead, quartz, stainless steel, titanium, ceramic, or tube-bundled Teflon tanks can be used, depending on the electrolyte type. Anodes are made of molten tin, free from impurities, especially from lead. Terminals can be made of nickel, or, for alkaline baths, copper. They should not touch the solution in the tank. The anode abutments can be used by melting. The anode surface varies: it is half of the cathode surface for alkaline baths, while it is usually double for acidic baths. For tin plating the inside of hollow objects (e.g. pots), they are filled with the bath solution and a tin rod is placed in the centre, which is connected with the positive pole of the rectifier; connecting the container with the negative pole, the electroplating takes place. In acidic baths, tin anodes are shaped as plates with a rectangular section and bagged in terylene or polypropylene. 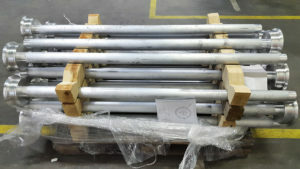 In alkaline baths, the use of anodes with an oval section is recommended; bagging is not recommended, especially since the person in charge with the electroplating must observe the colour of the film that is produced during the process and deduce the electroplating conditions from it.